Having grown up on a dairy farm in south Jersey, Blossom Kornbluh Frankel ’55 was the first in her family to attend college. She held three jobs to afford tuition, which, at the time, was a few hundred dollars per semester. 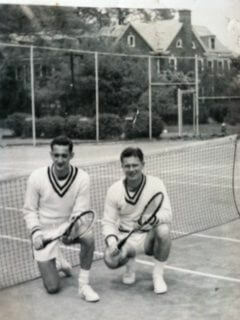 On her first day on campus, she met Eugene Frankel ’54, a tennis star from Jersey City. They married, had two children, and the rest is history—until 2016. Little did they know that 60 years later they’d be making history of their own at their alma mater with this TCNJ first: his-and-hers scholarships. Every year, Blossom returns to the college to meet the recipient of the Eugene Frankel Scholarship, a fund she formed in 1987 to memorialize her late husband [on left in photo]. She shakes hands with the School of Engineering recipient—in recognition of Eugene’s major—receives thanks in person, and marvels at the changes to campus since her days in the 1950s. It’s one of the highlights of her year. This year, the presentation of the Eugene Frankel Scholarship was followed by a surprise for Blossom: the announcement of a biomedical engineering scholarship in her name, formed by her children Andrew and Dorian, in recognition of her lifelong interest in health that began with her active days on the farm where she still lives today. “I was stunned,” recalls Blossom, when she learned that her children pledged to donate $30,000 over the next five years to establish this fund. This his-and-hers scholarship structure is unique for TCNJ, but was an obvious choice for Andrew and Dorian.